Woohoo! We’re in February and ready to celebrate winter’s impending departure, we hope. Come out and relax with wonderful brunch fare and rocking string trio music. 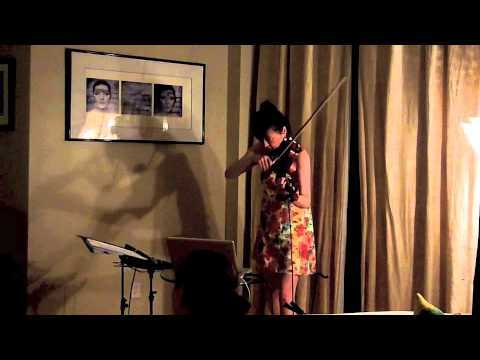 Martha Colby (cello), Leanne Darling (viola), and Helen Yee (violin) will help you shake off the winter blues. You won’t regret it. For the June Salon, Mark Lamb Dance will combine forces once again with the improvisational string virtuosos, violinist Helen Yee and violist Leanne Darling. The June Salon also features acclaimed movement artist Deborah Gladstein, along with Mark Lamb, and his group including dancers Brittany Antle, Korhan Basaran, Nicole Pouliot, Sarah Pope and Megan Ward. Who can resist the charms of Jessica’s delicious brunch fare and Linger’s warm ambience? Not us! Come wish Leanne well as she begins her summer stint at Yellowstone. One set only. Part of the Amplified Sundays series. 2 sets.